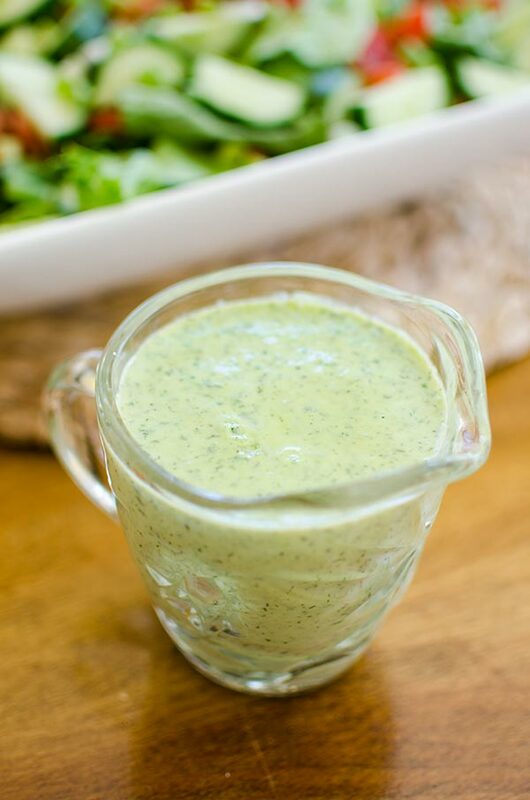 A vegan and creamy homemade herbed tofu salad dressing with parsley, dill and soft tofu. I’ve always gotten quite a positive response to my homemade salad dressings (they are some of my most-popular recipes), but it’s been far too long since I shared a new salad dressing recipe with you. 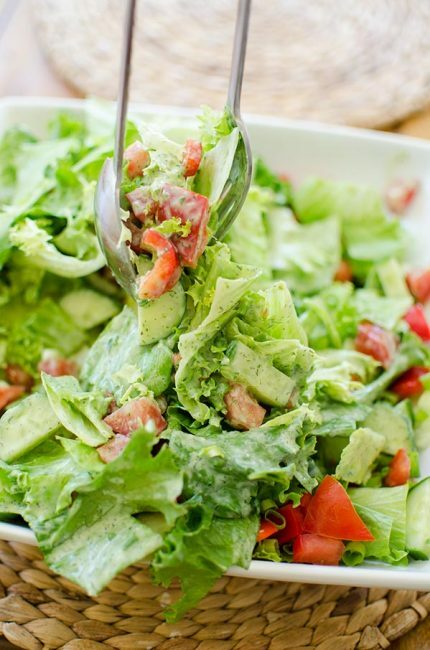 This recipe is pretty unusual because like in my hummus salad dressing, the base of this dressing isn’t your typical combination of oil and vinegar. Yes there is oil and an acid in this dressing, but like the title hints, I’ve opted to use tofu for a creamy, vegan dressing. Think of it this way, the tofu replaces mayonnaise. Along with the tofu, I’m using almond milk (to keep things vegan, but you could also use cow’s milk as well), a touch of garlic, fresh parsley and dill. This dressing really is herb-loaded. I love using fresh herbs in my cooking, especially in the summer! I find that a lot of home cooks don’t really use fresh herbs as much as they should. I’ll give you a hint that I’ve picked up from some very talented cooks I know who have worked in some of the top restaurants; fresh herbs are just one of many chef’s secrets, use them often and almost always fresh. I wrote an entire piece on fresh vs. dried herbs for Chatelaine, but here’s the major takeaway: dried herbs are best in slow-cooked dishes like soups or braises, while fresh herbs are the perfect finishing touch and should be added to a cooked dish about 20 minutes before it’s ready. Because this dish doesn’t require any cooking, and it’s almost the summer (so soon enough, herbs will be all over the place) I’ve decided to use fresh in this recipe. I’ve also made this recipe with dried dill in a pinch, which was fine, but I wouldn’t recommend using dried parsley in this recipe. The parsley gives it such a kick of fresh flavour, that the grassy nature of dried parsley won’t have nearly the same impact. For this dressing, I like to serve a simple salad of romaine or spinach with bell pepper, cucumber and green onions but this tofu salad dressing would work really well with pretty much all greens and vegetables. I actually think that this would be incredible with zucchini noodles! You’ll have to let me know if any of you try that out, I think that’s a dish I’ll be enjoying this weekend. Be sure to follow me on Instagram and Snapchat to keep up with my every day life. Let me know if you give this tofu salad dressing in the comments below.